Burro Crane #B-63 was built by Cullen-Friestedt at thier Chicago plant for the Western Pacific in 1927. It is powered by a 4-cylinder Buda engine. It was donated to Mid-Continent in 1973 and is diplayed near the depot. The Burro Crane trade name was dubbed the “Pack Animal of the Industry” by Cullen. 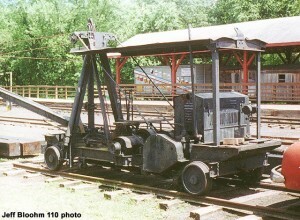 This convenient light-duty crane was used to move ties, rail, and other track materials along the tracks. Cullen-Friestedt was formed in 1907 to manufacture lifting and material handling equipment. It is still in business today as a division of Badger Equipment Company with a plant located at Winona, Minnesota.